We have a clearance sale going on in the shop until mid-April, when things will be shut down so we can welcome kiddo #2 into the world with minimal distraction. Check it out, all the 8 1/2 x 11" prints are marked down to $10! In order to set up our new bedroom, I've disassembled the computer and printers to move to the old bedroom. I print each larger print upon order, which means the larger prints won't be available again until some time after Fox's arrival. Interestingly, we haven't created a nursery for him. We worked and planned so much for M's nursery and never really used it as one, it just functioned as a studio decorated as a nursery. Carried over from that experience, we haven't felt the pressure to get a space ready for him. Since finding out #2 is a boy, I've been sorting and purging the attic full of M's old clothes and nursery items, keeping those that are unisex. Thankfully we're all set with clothes, sheets, and toys. After a little time over at the Lay Baby Lay blog, though, I realized there was something missing. 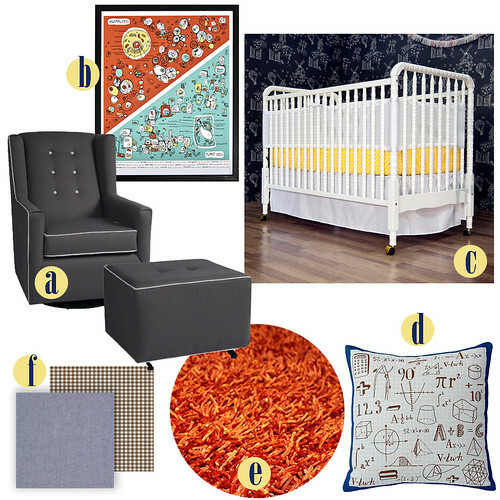 One thing I wish we'd gotten for Mabel's nursery was a comfy, sleep-in-able glider/rocker and ottoman. The Eames rocker just didn't work out for those exhausting nights of rocking M to sleep...I can only imagine how nice it would be to snuggle up into a cushy arm chair rocker and lull myself to sleep snuggled up with both of the little ones.The dream of a modern, clean lined glider prompted me to pull together a few ideas for Fox's room. Now, if I sell a measly (ha!) 50 prints in the next 5 weeks we just might make that dreamy glider happen! a. Little Castle Charleston swivel glider; b. Brainstorm Print and Design Plant and Animal print ; c. DaVinci Jenny Lind Crib (we've since passed the crib M used along to her cousin, looks like it's pretty easy to find a similar one on craigslist); d. A + B + C pillow from Land of Nod; e. shaggy orange rug we already own; f. And just for the sake of pulling the look together, swatches of brown (gray or navy would also work) gingham crib sheet and chambray for the crib skirt. I have no real source for those, I just like the pattern and color plus we have an abundance of white crib sheets.